My passion for sea glass has led me to share these treasures of the sea with you. 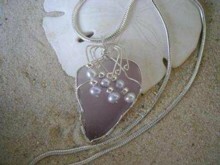 My jewelry showcases all natural sea glass with sterling silver. Some pieces may include beautiful accents of Freshwater pearls, Jade from China, Amethyst, green Agate and Swarovski crystals. You can create your own keepsake treasure by ordering a custom design and incorporating your own sea glass and precious stones to your piece. 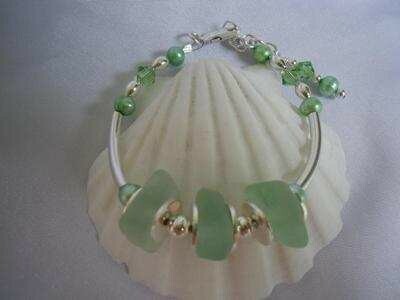 I am also working on a line of sea glass ankle bracelets. I have always loved Art and creative projects of any kind. While living on the Eastern Shores of Virginia my husband and I began to discover many treasures on the beach. I began to experiment with my new found treasures - being a certified picture framer I started creating three dimensional designs using sea shells, driftwood and sea glass. I sold these framed works of art through the frame shop I worked at. and how to drill sea glass from video?s and reading I begun to design jewelry and have fun creating. My son and his wife live in Hawaii and I have passed the bug of sea glass collecting on to them. They have mailed me beautiful sea glass from Hawaii which I also use in my sea glass jewelry. I find sea glass so fascinating and each piece is so unique I will always be touched by the history of sea glass. Forever in Sea Glass in Connellsville, Pennsylvania is not part of OdysseySeaGlass.com. We provide this listing as a free service to other sea glass related businesses. So, if you need information about the business on this page, you will have to contact them directly. Their contact information appears below. I currently sell my jewelry from my website and you can see more of my jewelry designs on my Facebook site Forever in sea glass. I have also been doing art shows and have some items at an Art Gallery here in town. We are looking to relocate to North Carolina and hope to open up our own shop there. Join in and write your own page! It's easy to do. How? Simply click here to return to Directory Sea Glass .